DuWanye Schwartz’s approach for supporting MDA is straightforward: More is more. DuWayne, a member of Neenah Menasha, WI Fire Fighters Local 275, has been a professional fire fighter for nearly 18 years, and during that entire time, he’s supported MDA — first by participating in the MDA Shamrocks program and then Fill the Boot, a fundraising collaboration between MDA and the International Association of Fire Fighters (IAFF) that has raised more than half a billion dollars for MDA families over the last six decades. 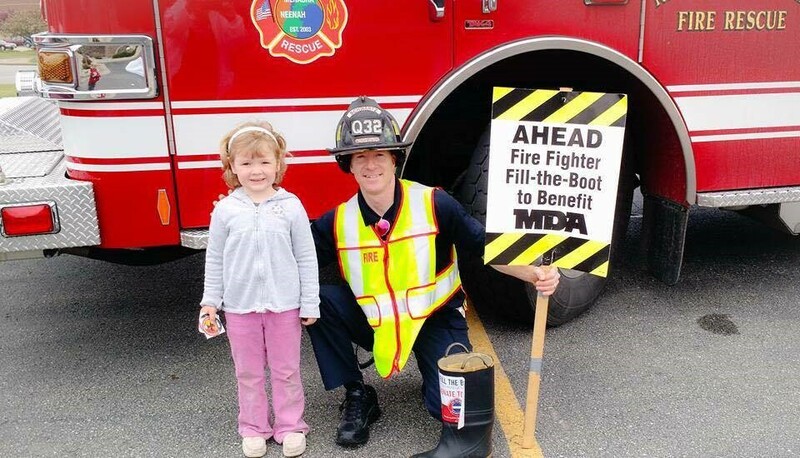 DuWayne is currently serving as one of two MDA Fill the Boot coordinators for his local, and he’s all in when it comes to lending tremendous support for individuals and families living in his area with muscular dystrophy and related life-threatening diseases. In 2017, Local 275 has raised nearly $21,000 for MDA, more than twice the total in 2016. For DuWayne, it all comes down to helping kids. 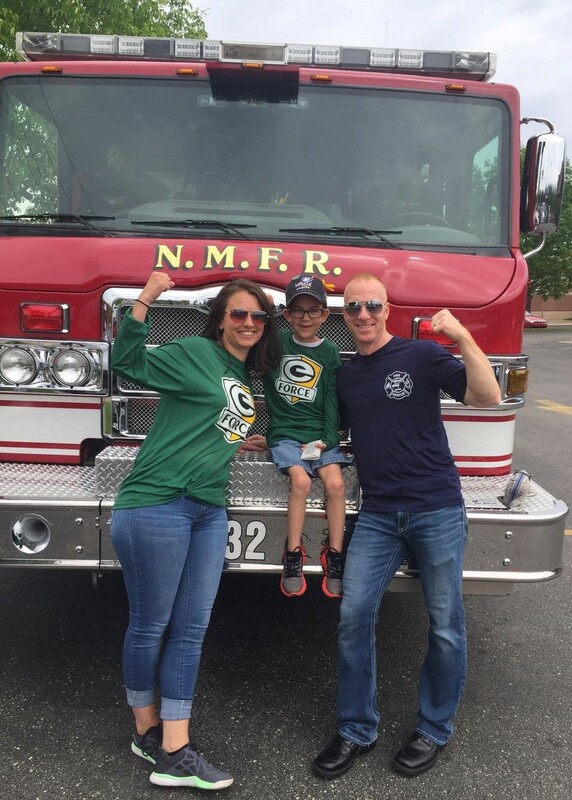 Last year, he joined MDA’s Muscle Walk in Green Bay for the first time, walking for Team Evan and supporting Evan Petersen, who lives with centronuclear myopathy. 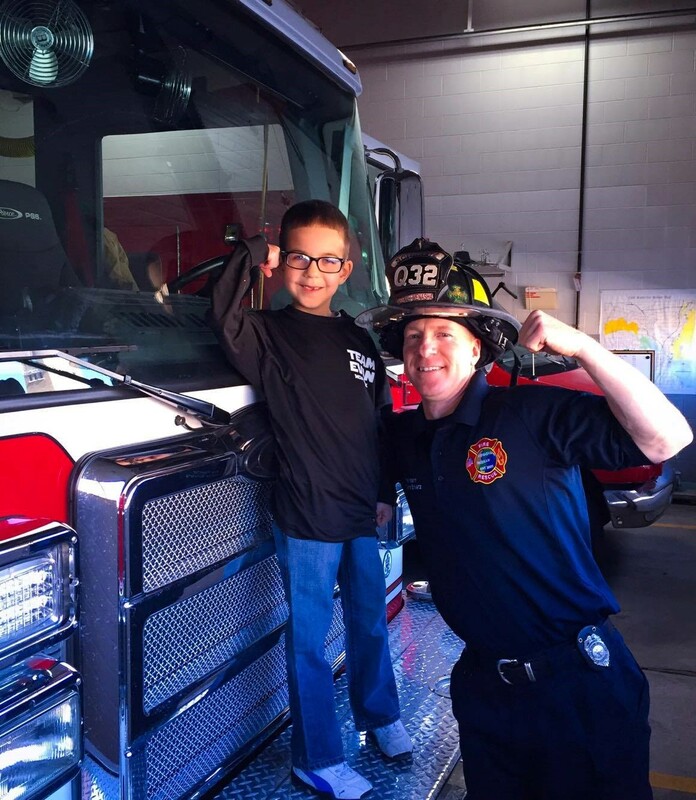 He met Evan at the MDA Wisconsin offices’ Boot Camp for fire fighters throughout the state. DuWayne’s other great passion is fitness. Normal marathons aren’t quite enough — and he admits that he does “some crazy stuff.” He competes in elite Spartan races and obstacle courses for Team Momentum, MDA’s training and endurance program that empowers individuals of all abilities to dedicate miles to help kids and adults with muscular dystrophy, ALS and related life-threatening diseases. Last year, DuWayne raised $1,000 for MDA through Team Momentum, handily besting his original goal of $350. The life of a professional fire fighter is nothing short of demanding, with 24-hour shifts of lifesaving work, which can take him away from his own children’s sporting games or family holidays. But he feels fortunate to be a fire fighter and everything that means for his community — including giving back to his community. Join DuWanye in his efforts to help MDA families live longer and grow stronger.